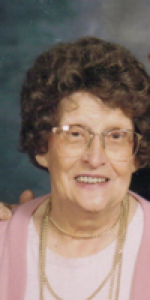 Beatrice F. Maier, 94, Dorothy Love Retirement Community, 3003 W. Cisco Rd., Sidney, Ohio, died at the retirement community on Sunday, December 28, 2008 at 3:50 PM. She was born July 11, 1914 in St. Mary&#39;s, Ohio the daughter of Leroy and Caroline (Saar) Glass. She was married September 6, 1933 to John H. Maier and he died March 12, 2001. Surviving are three children, Joan Copella and husband Ken of Sidney, Ohio; Marilyn Kemper of Minster, Ohio; Janet Born and husband Bob of Sidney, Ohio; and Carolyn Miller and husband Ron of Sidney, Ohio; eleven grandchilren; five great-grandchildren; one son-in-law, Elton Kemper and two grandchildren and one brother and one sister are deceased. She graduated from Holy Angels School in 1932. She was a member of Holy Angels Catholic Church and was in the Sacred Altar Society. She had worked at Wagner Manufacturing in Sidney as a cook for many years. A Mass of Christian Burial will be held on Friday, January 2, 2009 at 10:30 AM at Holy Angels Catholic church with Rev. Jason Bedel. Burial will be at Graceland Cemetery, Sidney, Ohio. Friends may call at Salm-McGill and Tangeman Funeral Home in Sidney on Thursday, January 1, 2009 from 6-8 PM. Memorial contributions may be made to Holy Angels Catholic Church, 324 S. Ohio Ave., Sidney, Ohio 45365 or Lehman High School Scholarship Fund, 2400 St. Mary&#39;s Ave., Sidney, Ohio 45365. Envelopes will also be available at the funeral home.